Found this super cute S'mores in a Jar over at Mommy Savers. 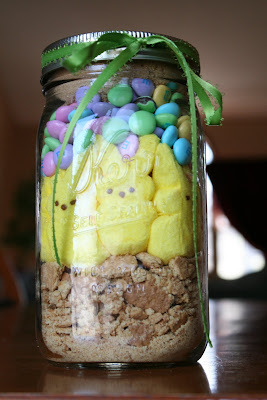 A cute idea for an Easter party favor, hostess gift or for teachers. 1. Take one sleeves of graham crackers and crush to make crumbs. 2. Layer crushed grahams on bottom of mason jar. 3. Place bunny Peeps standing up facing out around inside of jar. Press them up against jar but don't squish them. 5. Pour springtime colored M&Ms on top. 6. Spoon 1/3 cup of brown sugar on top M&Ms. 1. Empty the jar contents into bowl. Snip the bunnies into bits. Return the bunny bits to bowl and mix well. 2. Melt 1/2 cup butter and add 1 tsp of vanilla over dry ingredients, mixing well. Pat into a greased 9" square pan. Bake at 350 for 15 minutes. Cool and cut into bars.